"And the cutest owl award goes to.....the Northern Saw-whet Owl!" They look so cute and cuddly by day, but by night they are vicious mice killers. eBird reports of Northern Saw-whet Owls over the last decade. Have you ever seen one? 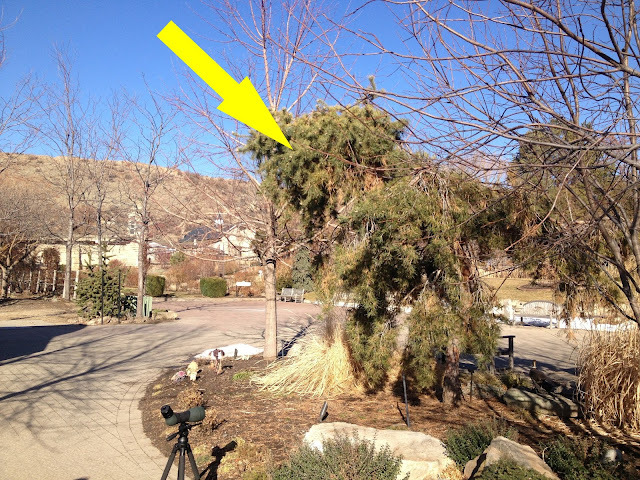 With the recent warm weather we've been having in the Boise area, the staff at the Idaho Botanical Garden figured it was time to take down the Christmas lights from the various trees. While removing the lights from the 10' tree pictured below, a staff member noticed a tiny owl that perched as quiet and still as could be. It didn't even budge as the lights were completely removed. It has returned to the same perch consistently over the last week. The NSWO is so tiny and camouflaged that it could not really be seen from the outside. By standing on the rock in the bottom of the picture, one could look up into the domed canopy of the strangely shaped pine tree and see the owl a few feet overhead. See the Swarovski ATX spotting scope there? Optics were of no use as the little owl was so low in the short tree. Garden staff members have been standing by encouraging conservative quiet quick looks at their little celebrity. These photos were taken with my iPhone. 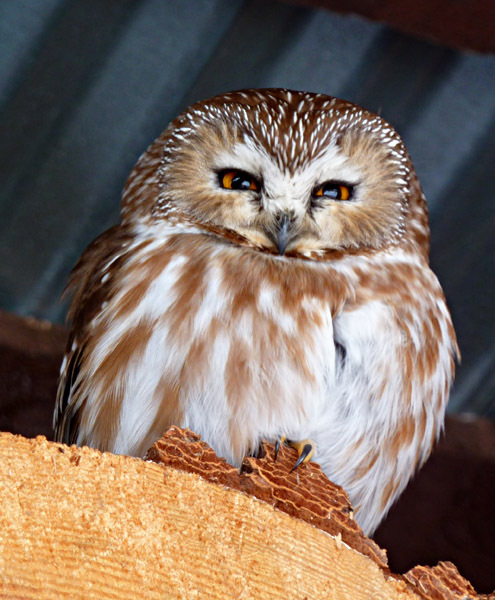 As I had only "seen" a Northern Saw-whet Owl once previously, in downtown Tempe, Arizona of all places, I really wanted to see one again, especially after seeing Cliff's cute photos from his woodshed. I have heard them on a couple of occasions at my friend Jason Talbot's family cabin in Round Valley, Idaho. Closely cropped image from my iPhone. well spotted! I would have missed it for sure. Darn that's cute. Cute though they are, I do not know that we can give them the 'cutest owl award' so quickly and without due process. Elf Owls, Flammulated, Pygmy...it just seems like this bill needs to sit in the Senate for a while before a verdict is made. As one who has seen all those owls that you least and thy are all indeed very cute I can objectively state in no uncertain terms that the NSWO is the cutest. Sweet owl ... I would LOVE to see one! I'm surprised the staff member spotted this cutie. Hello there. This blog is awesome! Very informative. Thank you for sharing.